Akbar had resigned as junior External Affairs Minister in the wake of allegation of sexual misconduct during his tenure as a senior editor. 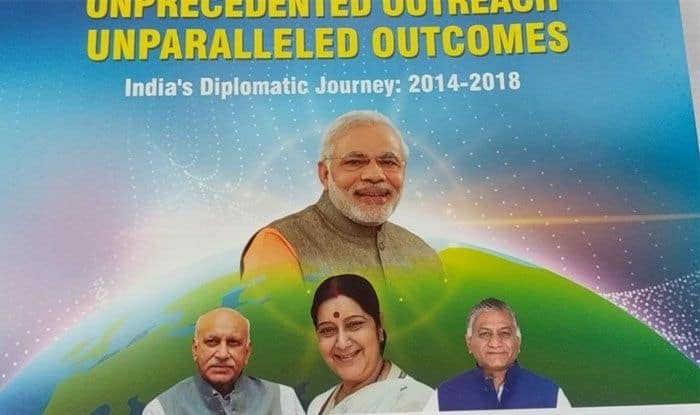 New Delhi: A controversy erupted on Monday after a booklet featuring M J Akbar, who resigned as Minister of State for External Affairs over allegations of sexual misconduct by several women, was distributed to delegates at the Pravasi Bharatiya Diwas in Varanasi. The Congress attacked the government, questioning whether Akbar had not resigned as MoS. “Featuring the #MeToo accused as a star? Hasn’t he resigned?” Congress spokesperson Priyanka Chaturvedi tweeted in response to a post on the booklet. Akbar had resigned as junior External Affairs Minister in the wake of allegation of sexual misconduct during his tenure as a senior editor. The alleged incidents came to light during the #metoo movement. Akbar had denied the allegations. A number of women journalists also took to social media to criticise Akbar finding a place in the booklet handed out to NRI delegates at the 15th Pravasi Bharatiya Diwas. Clarifying over the controversy, sources in the ministry said Akbar is not at all associated with the event and that the booklet was published in May last year, months before he quit as minister. The booklet highlighted achievements of the MEA in the last four years and all the ministers in the MEA featured in it. “The booklet was published months before Akbar quit as a minister. An unnecessary controversy is being created which is very unfortunate. The booklet only mentions achievements of the ministry,” said a government official. In the booklet, Akbar also features in the inside pages as part of “Team MEA” alongside External Affairs Minister Sushma Swaraj, MoS General VK Singh and others. The theme of the event this year is, “Role of Indian diaspora in building a New India”. Prime Minister Narendra Modi will inaugurate the Pravasi Bhartiya Divas on January 22 in Varanasi, his Lok Sabha constituency, while President Ram Nath Kovind will grace the concluding function on January 23.